For the filling, combine the pork, prawns, spring onion, soy sauce, salt, sesame oil, cornflour and pepper. Place a wonton wrapper on a clean work surface. Spoon 1 heaped teaspoonful of filling mixture into the centre of the wrapper. Brush edges with a little water. Fold into a triangle shape and firmly pinch edges together to enclose the filling and expel any air. Then pull the two triangle edges together to form a tortellini shape. Repeat with remaining prawn mixture and wrappers. You can freeze wontons at this stage or proceed to cooking. Fill a saucepan or wok to about 1/3 capacity with the vegetable oil. Heat over high heat. 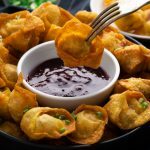 Once the oil is hot (325°F or 165°C or when a wooden spoon dipped into the oil forms small little bubbles) cook the wontons until golden. Flip them a couple of times as they cook to ensure an even colour. Drain on kitchen paper.